In the early days of Los Angeles County, campaigns for the post of district attorney were humdrum. Every two years, the county Democratic Party would hold a convention; its nominees for district attorney (and other county posts) would be ratified by voters at the general election. After the Civil War, Republicans would band with members of other parties and put up candidates for DA, but would lose—except in 1873 when the “People’s Reform Party” emerged, comprised of both Democrats and Republicans. It was not until 1884 that a Republican, George Holton, was elected district attorney. Though a two-party system was now in place in the county, the campaigns were fairly bland. That ended in 1892 with a rip-snorting donnybrook between the Republican candidate and one put up by both the Democrats and Populists. James McLachlan and Henry C. Dillon were the prime combatants in the race for district attorney in 1892 (with a Prohibitionist also in the race). Incumbent McLachlan was a Republican and Dillon was the nominee of both the Democratic Party and the People’s (or Populist) Party. The contentiousness was no doubt heightened by the news reports and editorials (the distinction between them often being difficult to discern) carried by the county’s three highly partisan newspapers, the Times and the Express, with Republican loyalties, and the Herald, a backer of the Democratic Party. 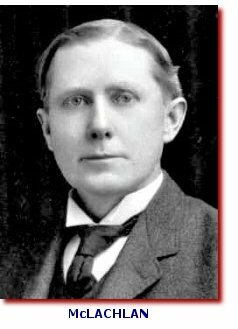 McLachlan had been born in Scotland on Aug. 1, 1852, emigrated to the U.S. with his parents at the age of 3, settling in Thompkins County, New York. It was in that state that he was educated and, after obtaining a law degree and master’s degree in 1878, was elected Thompkins County school superintendent on the Republican ticket, serving for three years. He became a lawyer in Ithaca, New York, in 1880, then he and his wife, who were newlyweds, moved to Pasadena in 1888. 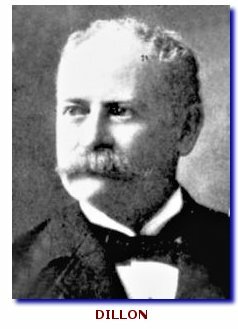 He was in private practice, and served as assistant district attorney under Republican Frank P. Kelly, the DA from January, 1879 to January, 1881. Delegates conferred 236 votes on McLachlan, with 96 going to “Major” J.A. Donnell—who was to become the party’s successful nominee for the post two years later—and 25 to Jesse Hardesty. In that first election, McLachlan garnered 9,987 votes, Munday 8,919, and Prohibitionist William T. Kendrick 1,155. Dillon was born Nov. 6, 1846 in Wisconsin—his non-immigrant status being contrasted by him with that of his opponent during the course of the election. Dillon’s father came to the U.S. from Ireland and his mother, of Welsh ancestry, had been born in North Carolina. “My parents were poor and my education had to be obtained by hard work,” a speech by Dillon, published Oct. 16, 1892, in the Herald, recites. The candidate’s speech contains a reminder that “all of you who sat in the People’s party convention know how reluctant I was to accept” the nomination for district attorney, “yielding only to the imperative demand of the party,” and that he was in Northern California when the Democrats voted at their convention to list him on their ticket. The Oct. 15, 1892 speech that was printed in the Herald had been delivered by Dillon the previous day, a Saturday, in Downey, then an unincorporated area of the county (as it remained until it became a city in 1956). Although the text reflects that there had been previous attacks by Dillon on the incumbent—the challenger declaring that some of McLachlan’s “too ardent friends charge that I am conducting a campaign of personal abuse”—it was that Downey address that gained press attention and marked the start of the county’s first fiery contest for district attorney. He recites that in 1885, the expenses incurred by the office were $4,472.88, while expenses during McLachlan’s first year in office were $18,151.46. This included, he says, $750 paid to former District Attorney Stephen M. White (a Democrat) for a legal opinion on title to the courthouse. “In 1888, when the costs of this office were $6,800, the population was about 136,000,” Dillon tells his audience. “In 1891, when it cost over $17,000 to run it, our population was only 105,000. Dillon expresses astonishment at the high expenses of running the office in light of McLachlan having 10 deputies and a light workload. While accusing Dillon of “juggling figures,” the Express did not elaborate, nor did it provide substantiation of its allegation that Dillon paid to have the text of his speech run in full. While McKinley’s factual recitation that Dillon had tried before him only one minor civil case is a statement of a sort which any forthright judge today should not hesitate to supply, the political commentary would be entirely out of line these days. But back then, judges, like district attorneys, were tied to the political parties that nominated them. An article in the Express on Nov. 2 reports that Dillon had appeared in Wade’s court only on two pre-trial matters relating to the quieting of title, and quotes Wade as praising McLachlan’s abilities, as displayed in the “many” matters before him prior to McLachlan becoming district attorney. Tomorrow, I’ll relate McLachlan’s eventual response to Dillon’s charges, the outcome of the race, and what became of the two candidates after that, including Dillon bringing an action for $54.50 which wound up in the California Supreme Court.